The HandiWall 4″ Double Hook stores and organizes long handled tools on garage slatwall panels. 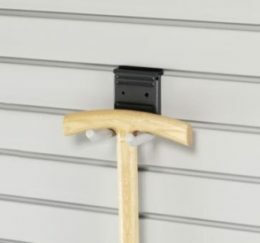 Designed to fit most standard 3″ on center slatwall panels, even those panels with metal inserts. Hooks are rubberized to prevent damage to your tools. Measures 3 5/8″ high x 4 3/4″ deep x 3″ wide.